Better Buy For a Trump Presidency, Gun Stocks or Prison Stocks? Will Donald Trump's presidency benefit one or the other -- or both? With immigration policy such a central part of Donald Trump's presidential campaign, it's not surprising private prison stocks jumped higher following his election. Image source: Getty Images. Donald Trump's surprise electoral victory turned more than just the political world upside down; it also caused the reversal of fortunes of two groups of stocks: gun manufacturers and private prison operators. Where Smith & Wesson Holding (NASDAQ:AOBC) and Sturm, Ruger (NYSE:RGR) had been rising on the assumption that a Hillary Clinton presidency would spur calls for greater gun control, thus generating more demand to buy guns before it was enacted, Trump's upset seemingly took the immediacy of the need off the table, and their shares plunged. Conversely, both CoreCivic (NYSE:CXW) and GEO Group (NYSE:GEO) had seen their shares severely depressed after President Obama's Justice Dept. ordered federal prisons to begin winding down their use of private facilities, but Trump's trumping the conventional wisdom saw their shares surge on the belief they would become a critical component of a crackdown on illegal immigration during his term of office. 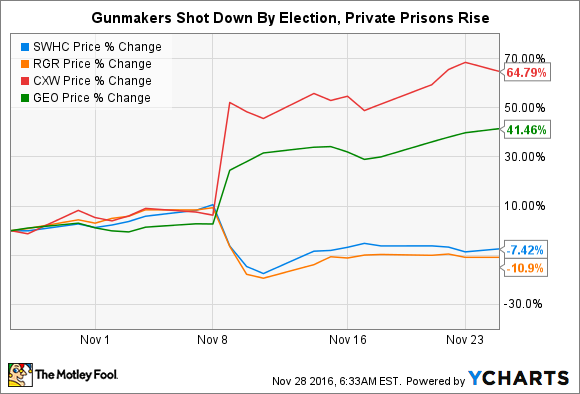 While shares of the gunmakers have bounced back some since then, perhaps on the belief that demand for firearms isn't going away anytime soon, and private prison stocks have jumped even higher, which group would make the better investment going forward with President-elect Trump? Like so much of what the conventional wisdom got wrong this year, the smart money had said the reason gun sales have been white-hot was because of the ever-present threat of more strict controls on ownership being imposed. With a Supreme Court vacancy to be filled, a Clinton presidency would have continued that trend. Yet despite the rhetoric, no major piece of federal legislation ever advanced very far, and even the executive orders President Obama issued early this year were fairly watered-down affairs. It also missed the undercurrent of fear that permeated gun sales, the need to protect yourself, your family, and your property. When you look at the guns Smith & Wesson, Ruger, Glock, Beretta, and Sig Sauer were actually selling, they weren't just the sort of weapons that would typically be targeted by gun control advocates, such as the so-called assault rifles -- though modern sporting rifles have always been and remain today among the most popular guns sold -- they were those used for concealed carry that led the way in sales. Smith & Wesson's M&P Shield model, designed specifically for the CCW market, has been one of the gunmaker's most popular guns since it was introduced in 2012. Ruger's LC9s, similarly compact in design, is credited for helping new product introductions to account for 30% of total revenues this year. Another top gun buyer's choice is the 3.3-inch Springfield Armory XD-Scomes in either 9 mm, .40 S&W, or .45 ACP versions for a variety of firepower options. So, it's not so much fear that people won't be able buy guns that is driving the FBI to perform record numbers of criminal background checks on purchasers, but rather incidents of civil unrest and acts of terrorism that are causing people to arm themselves to protect their families. The fact that there have been even more disturbances and riots in the wake of Trump's election will only convince more people they still need to acquire a means of protection. The Justice Dept's private prison memo for "ultimately ending [...] [the] use of privately operated prisons" was viewed as a death sentence for the facilities. CoreCivic (formerly known as Corrections Corp of America) would see its contracts for 10,800 beds at its three affected facilities reduced to just 3,600 beds, representing about 7% of its total revenues, while GEO Group has five prisons under contract, with the Federal Bureau of Prisons representing 11,000 beds that account for 14% of its annual operating revenues. Even though the federal prisons covered by the memo only account for 13 facilities housing 22,000 prisoners, it still represented a shot across the bow of the prison operators, because other agencies will be put under pressure to follow suit. Trump's election has likely upset those plans. Private prison operators do most of their business not with BOP, but rather Homeland Security. In fact, federal government-run facilities only account for 11% of DHS's Immigration and Customs Enforcement detention centers; private facilities like the ones CoreCivic and GEO Group operate represent the vast majority of Homeland Securities' detention beds. Between 2005 and 2014, private facilities grew from operating just 25% of the total to some 62%, and over the past 20 years, the Center for American Progress says the system has grown from less than 7,500 beds to the 34,000 beds federal law mandates today. Homeland Security, and all that that entails is, of course, a centerpiece of Trump's domestic agenda. He offered a 10-point plan in which, along with the construction of a wall along the southern border. He promised to triple the number of ICE agents working, make anyone caught illegally entering the country subject to deportation, and said "anyone who illegally crosses the border will be detained until they are removed out of our country." That task will require not only the full use of existing facilities, whether public or private, but it will likely encourage the construction of new ones, too. CoreCivic, for example, currently has seven facilities that have been idled with a design capacity of almost 8,300 beds. It also has four other idled facilities, but they might need remodeling or expansion because they were designed for uses other than adult secure correctional purposes. GEO Group has approximately 3,300 vacant beds at four idled facilities. It notes that if all of those beds were filled at current per diem rates paid by the government, it would add about $70 million to total annual revenues and boost earnings by as much as $0.25 per share. It seems clear why the markets were excited by the prospects for private prisons under a Trump presidency. The fact is, both groups of stocks can be good bets for investors. There doesn't seem to be a limit on how high gun demand can run, and if groups that were upset by Trump's election continue to protest and riot as they have, it will only fuel the desire to arm oneself for protection. Similarly, if Trump carries through even partially on his promise of securing the country's borders, the need for more detention facilities will rise. Private contractors are able to respond more quickly to such demands than the federal government, which requires navigating a bureaucratic and labyrinthine regulatory maze before building a new facility. All four stocks trade well below their all-time highs, and almost all of them trade around 12 times trailing earnings (GEO Group goes for off at around 17 times). With each seemingly having strong catalysts for growth before them, a strategy of buying a basket of stocks that included all of them is one way to approach it. Still, Smith & Wesson and Ruger have the best earnings growth prospects for this year and the next five, and having been knocked down so far by the election, the gunmakers may be the better place to start.